One of the good things about big round bales is that they are very quick to stack. We just rolled them on to the forks on the tractor and rolled them off into the shed. We ended up with 24, so 18 in the shed and 6 in the tractor bay. I find it difficult to estimate how much hay there is compared to small square bales, but if each round bale lasts about 2 weeks that would be the equivalent of 150 small square bales which is what we hoped to get. 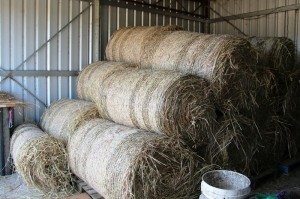 When I was buying bales before the harvest we were using 5 bales over 2 weeks between the horses and the goats. A square bale is typically 20-20kg and the rounds feel like they are at least 100kg – I can’t move them – so fingers crossed. Last year we had 125 bales but some of them were not useable as the damp capeweed caused some mould. We hoped for 150 this year as we had less competition from weeds and had more rain so the crop was much taller. Next year, we are hoping for even more as we move the crop onto the newly established oat paddock on the richer loam soils in the north east of the property.